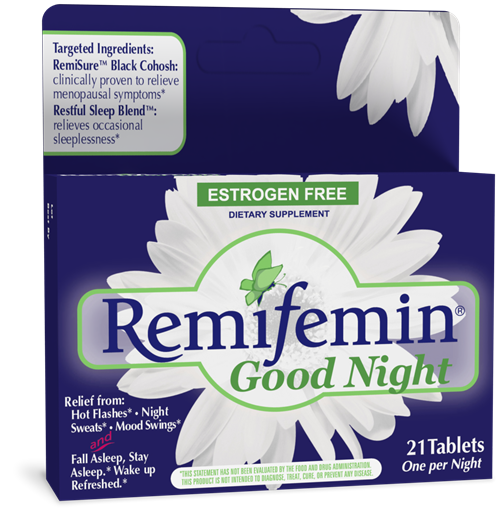 Remifemin® Good Night / 21 tabs - Nature's Way®. CAUTION: Consult a healthcare professional prior to use if taking prescription drugs, or if you have been treated for breast cancer or any other hormone-dependent cancer. Do not use if pregnant or nursing. Discontinue use and consult a healthcare professional if you have a liver disorder or develop symptoms of liver trouble, such as abdominal pain, dark urine, or jaundice. May impair your ability to drive or operate heavy equipment. Due to additive sedative effect, avoid using with alcohol. For further instructions please read the enclosed insert. Our black cohosh extract is standardized to be equivalent to 40 mg black cohosh root and rhizome. Remifemin® and associated logo designs with butterfly are registered trademarks of, and RemiSure™ is a trademark of Schaper & Brummer GmbH & Co. KG. Will this make me feel too groggy to get up in the morning? Can I take Remifemin® Good Night with my other sleep supporting supplements? Most supplemental sleep support contains hops and valerian, as does Remifemin® Good Night. Rather than doubling up on those ingredients, it’s probably best to stick with one or the other. You can always return to using your other sleep-supporting supplement once you feel your menopause symptoms have abated. Is Remifemin® Good Night habit forming? No, there are no known addictive effects to the ingredients in Remifemin® Good Night. Can I take Remifemin® Good Night with my prescription sleep medications? Are there any contraindications? Remifemin® Good Night does not treat, prevent, or mitigate disease (namely insomnia) and should be used carefully with medications which have a sedative effect (barbiturates, sedatives, anti-depressants, other sleep promoting drugs and/or other herbal sedatives). As with any dietary supplement, if you are taking any prescription drugs and/or any other over-the-counter product, please check with your doctor or pharmacist first before using Remifemin® Good Night. Your doctor or pharmacist is the best person to advise you based on your medical history and present state of health. Also, be aware Remifemin® Good Night may impair your ability to drive or operate heavy machinery. Due the added sedative effect, avoid using Remifemin® Good Night with alcohol. Should I take Remifemin® Good Night with food or on an empty stomach? It’s up to you—whether you take Remifemin® Good Night with or without food is matter of personal preference and convenience. It can be taken before, with, or between meals and won’t impact the effectiveness of the product.